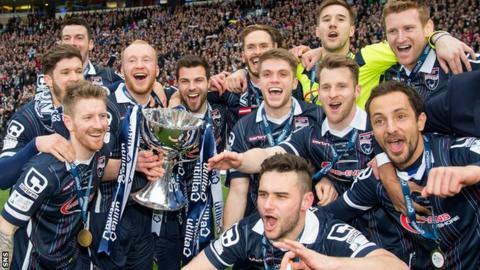 The Scottish Professional Football League has agreed a three-year deal with UK-based bookmaker Betfred to sponsor the new-style League Cup. It is worth around £1m over three years. This season's competition, won for the first time by Ross County, was sponsored by energy firm Utilita from the quarter-final stage onwards. Next season, it will revert from a straight knock-out competition to a group-stage format in the first round. Eight sections of five teams will play the round-robin, starting in July. It will involve 38 clubs not involved in Champions League or Europa League qualifiers, plus the winners of the Highland League and Lowland League. Betfred, which was established in Salford in 1967 but is now based in Warrington, is already the sponsor of the World Snooker Championship. It is also heavily involved in the horse racing's Grand National and in greyhound racing. The Scottish League Cup has previously been sponsored by Coca-Cola, Skol Lager, Bell's whisky, Co-operative Insurance and the QTS Group. County defeated Hibernian 2-1 in this season's final at Hampden Park.